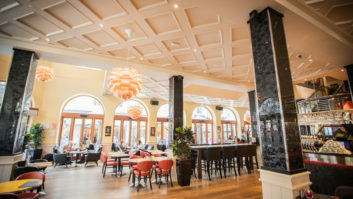 The Academy of Music Theatre in Northampton, Massachusetts has updated its sound system in order to meet the needs of its diverse programming, with sound engineer Jason Raboin designing and installing a system centred around Fulcrum Acoustic CX1595 15in coaxial loudspeakers powered by Ashly nXp amplifiers. The Academy now supports rock concerts, theatrical productions, films, literary arts, dance and youth programs, which drove the need for a system upgrade. The install presented a number of challenges such as the speakers needed to provide consistent coverage throughout the entire theatre without interfering with sightlines to the stage opening, or impacting the aesthetics of the 125-year old opera house. Additionally, the limited rigging options within the performing arts centre demanded compact, lightweight loudspeakers as part of a visually unobtrusive sound system. The CX1595 speakers in Raboin’s system provide the requisite output capability and optimal 90° x 45° dispersion pattern, while their lightweight, compact, visually unobtrusive design ensures minimal effect on sightlines and the Academy’s aesthetics. Two compact, portable Fulcrum Acoustic Sub215 dual 15in direct-radiating subwoofers provide concert-level low frequency for the theatre while also minimising visual intrusion.